What’s going in over there? Well, you guessed it, THERE’S AN APP FOR THAT! And it uses Open Data. 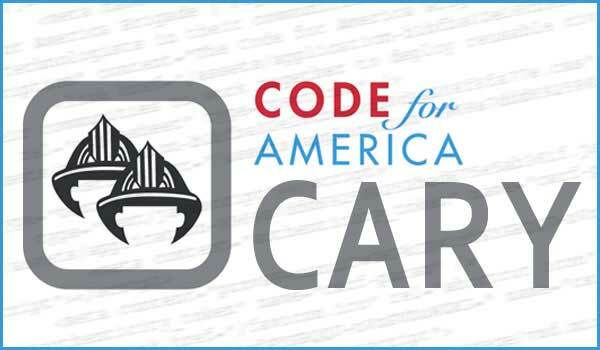 Thanks to the great work done by the new Cary Code for America Brigade (read more about them at the CaryCitizen), you can now get quick access to development information around Cary by using your smart phone or your computer. This impressive project does a great job at illustrating the value that Open Data can provide to citizens, by giving you the power to see what development is occurring close to home, or work, or in your community. 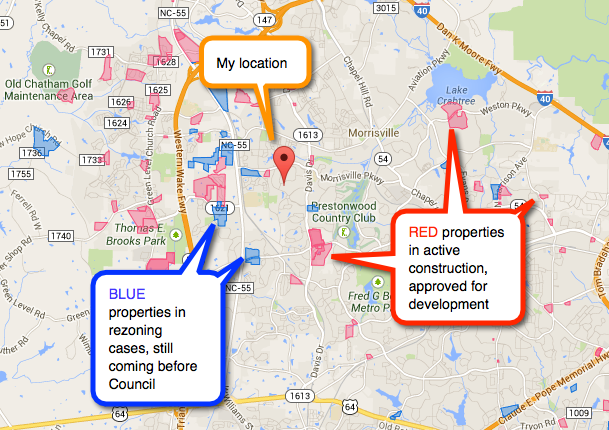 DevMapp is a very cool application that maps development in Cary – by mashing a Google Map along with permit and rezoning data provided by the Town. What does that really mean to you? Well, with this application you can look at its map (the app will locate where you are if you give it permission to do so) and then you can visually see where development is being planned across the town. 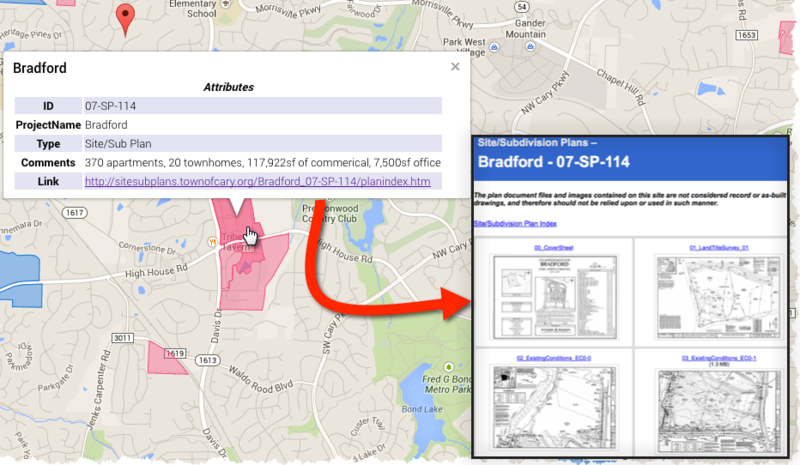 Just “click” on those properties that are highlighted and then you can dive down and review the plans associated with that property, see the rezoning applications, etc. So, I click on the property at the corner of Davis & High House – close to my house. And, lo and behold, I see it’s the Bradford development. 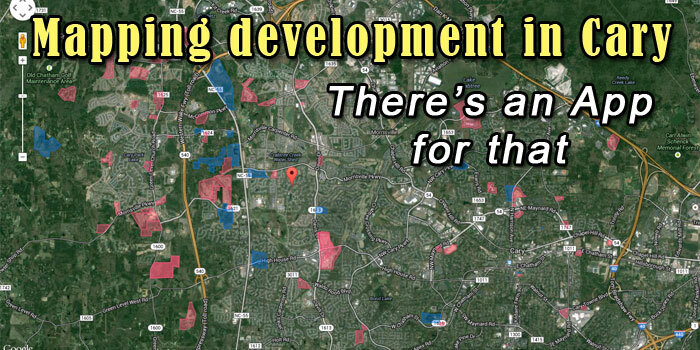 On that popup is a direct ink to the Town of Cary site and subdivision plans associated with this project. Woo hoo! Instant and easy access to what’s planned for that corner. Now, let’s look at a Rezoning: This time, I’ll click on a “blue property” – this one is on High House Road. 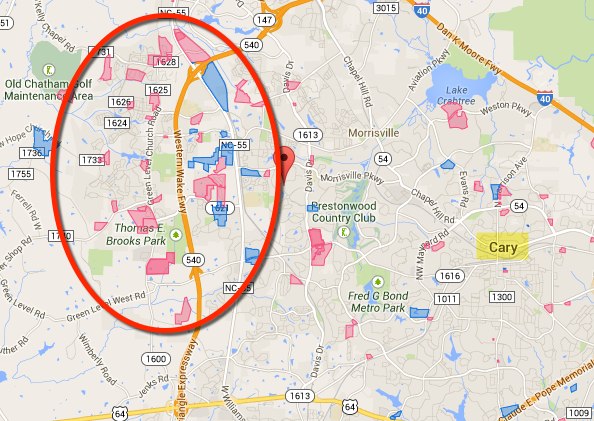 In this example, the rezoning pop-up is displayed, and also a hotlink to the Town of Cary Rezoning page. In this case, I see that the rezoning is in 2014, so I click on the 2014 rezoning page link. There, I see the information regarding this rezoning – such as the fact that it has a scheduled Public Hearing on June 26. And, finally, clicking on that link takes me directly to the Staff report for that property. Voilà! The application takes the rezoning and permitting information about a particular property that is going through the review process or in construction, and uses that data provided by the Town and then marrying it with the Google Map geolocation information. Finally there is a bit of magic – or what we call programming, by the team at the Code for Cary Brigade, to bring you this great application. 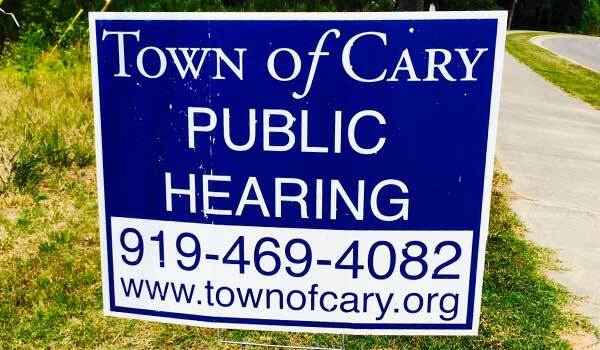 All of the information provided by the Town of Cary is Public Record and Open Data – and a great way to provide visibility of development in and around Cary in an easy-to-use app. Or, from your smartphone – type in www.codeforcary.org in your browser, and you can check it out there. 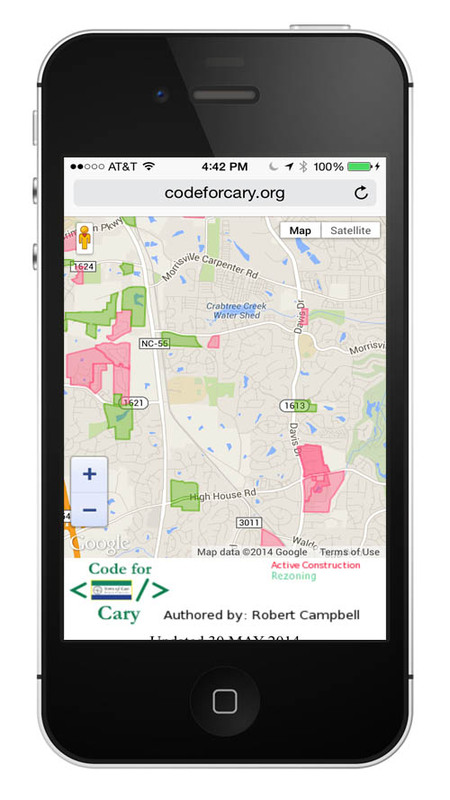 By the way, be sure to do a shoutout to the team that did such a great job on this – either on Twitter – @CodeforCary. Get involved with the Code for Cary team. You can learn more and meet them at one of their Hack Nights. You don’t have to be a programmer to help – lots of folks have great ideas and thoughts to improve the current application, or you may have ideas for new work to tackle. All are welcome.